Home » Android , Mobile Applications » Formspring Android App Launched! Formspring has launched its app for Android after its launch for iOS last week. There are almost 28 million people in Formspring. 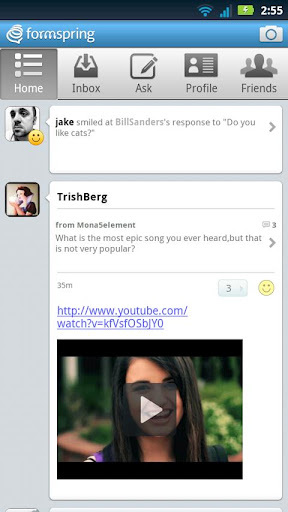 Formspring is a fun, easy way to ask questions, share photos and discover what’s interesting about your friends. Ask a question to your friends and contacts. Send photos from anywhere and get responses. Respond to questions with text or a photo. Smile at responses, and see who smiled at yours. Choose to follow publicly or privately. Download the app for FREE from market. Ubuntu for Android, Killer App in 2012?